Drew Brees and a few of his friends have been spotted hanging out in Lafayette. The New Orleans Saints Quarterback was seen enjoying the offseason touring the city, enjoying some food and taking tons of selfies with everyone who asked. One local woman who ran into Brees at Acadiana Lanes says her first time meeting the star quarterback was amazing. 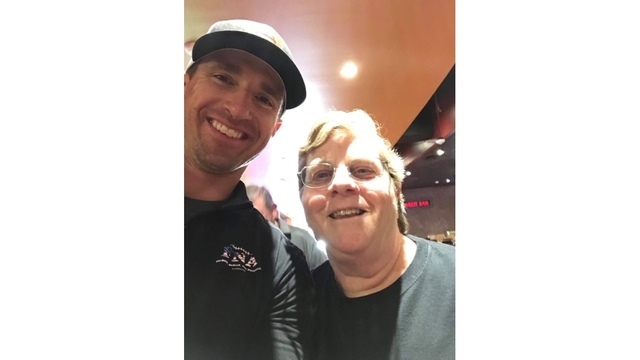 Shirley Bogenrief said Brees casually strolled into the bowling alley during her league night and when she approached him for a picture, she said that he was so kind and just grabbed her phone and snapped the picture. "Completely star struck," Bogenrief said. "Made my year." After he took the picture I don’t remember a thing. Lol." Bogenrief said rumors were spreading around the bowling lane that Brees was in town looking at some properties to purchase and open a few businesses. "I don't know if that's true, but it sure sounds good."